Immediate Press Release: Don’t Miss BOO BASH! Charity fundraiser for Dysautonomia! 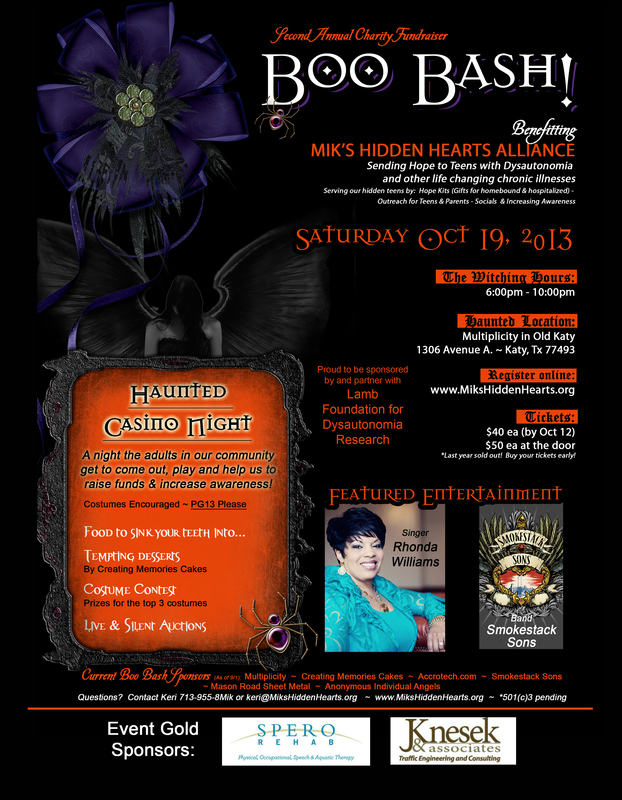 The hottest ticket in town this October is the Second Annual Charity Boo Bash Casino Night, October 19th, benefitting Mik’s Hidden Hearts Alliance! Get ready for a scary good time at this Halloween soiree! This party has everything for the adults in our community: casino night, live music from singer Rhonda Williams and dynamic band duo the Smokestack Sons, drinks, even a costume contest! There will be live and silent auctions with some exciting items up for bid. A catered delectable dinner will be served. While those with a wicked sweet tooth will enjoy the amazing Halloween dessert buffet offered by Creating Memories Cakes. The witching hours are 6-10pm at Multiplicity in the heart of old Katy. Tickets are $40 if you order by October 12, $50 at the door. For more information or to reserve tickets visit www.MiksHiddenHearts.org. Want to be a sponsor or donate an auction item? We appreciate it! Please contact us for details on how you can help! Can’t attend? Consider making an in-spirit donation. Mik’s Hidden Hearts Alliance was founded in 2011 by Katy teen resident, Mikaela “Mik” Aschoff after falling unexpectedly ill with Dysautonomia her freshman year of high school. After being homebound with this debilitating illness, Mik started MHHA to offer hope and help to local and national homebound and hospitalized teens with dysautonomia and other chronic life-changing hidden illnesses by sending them Hope Kits (teen focused gift items), outreach meetings, bring about Dyautonomia Awareness and plan socials like our “Anti Prom” held this past May for Houston area chronically ill teens. Dysautonomia is a complex condition caused by a dysfunction of the autonomic nervous system. It affects the cardiovascular, endocrine, metabolic and gastrointestinal systems and can cause very debilitating symptoms. For more information visit their website at www.MiksHiddenHearts.org. (Gold Heart Sponsors) Spero Rehab & Knesek & Associates Traffic Engineering and Consulting. (Silver Heart Sponsors) Lamb Foundation for Dysautonomia Research, The Cox Family and The Kotecki Family. Special thanks to the McWhorter and Trevino Families for their continued dedication and support for MHHA. Also, much appreciation to Dr. Numan, Dr. Butler, Rebecca Martinez, RN and the rest of the medical team at UTHSC Physicians/Dysautonomia Center for Excellence working with Children’s Memorial Hermann Hospital in Houston, Texas for their ongoing determination and dedication to help those who suffer from Dysautonomia. Save the Date: Upcoming MHHA Fam Social – Hope to see you! MHHA Teens & Fam Social: THIS upcoming Sunday Sept 22 at La Finca Mexican Restaurant on FM 1093 & Westheimer Lakes North in Katy (near Fulshear). RSVP: Email keri@mikshiddenhearts.org if you will be attending so we can save you a seat! Smokestack Sons and Rhonda Williams will be performing. You don’t want to miss it! 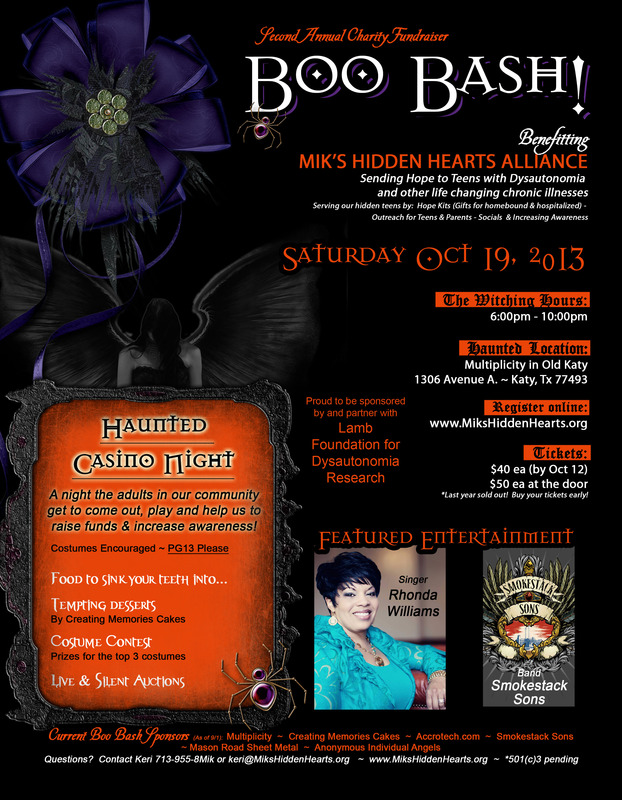 Boo Bash to raise funds for Dysautonomia Teens – Katy, Tx – Hope to see you there! Want to donate a live or silent auction item / gift basket? Click Here. All donations received through Oct 5 will be acknowledge in event program. All money raised will go directly to providing Hope Kits for homebound and hospitalized teens with Dysautonomia and other hidden life-changing illnesses.